Click on their logo for the PDF presentation. Note that some companies are missing. Leuko is developing the first medical device to non-invasively assess white blood cell (WBC) status and WBC differential. Assessment of WBC is necessary for the management of various medical conditions, such as the treatment of cancer with cytotoxic chemotherapy and serious infections with antiinfectives. There have been no advances in the assessment of WBCs in decades. We have re-imagined WBC testing without the need for blood draws by means of a mobile phone-sized portable device utilizing innovative optics. The initial focus will be on the hematology – oncology market in the U.S.; once proofof-concept and the value of our technology is demonstrated in patients with cancer, additional opportunities will be explored. Bessor Pharma has developed and is considering strategic alliance partners for a potential 1st in class, biomarker driven therapy for hard to treat cancers. We have discovered a new promising cancer target, the secreted protein renalase. Renalase is overexpressed in tumors and biological fluids of cancer patients and increased expression correlates with worse patient outcomes. Renalase knockouts block cancer development. Our drug candidate is a selective, anti-renalase mAb, which we are developing with Dr Gary Desir, chair of medicine at Yale. With a top R and D and business team we translate opportunities from universities for the biopharma industry with a focus on immuno-oncology and immuno-inflammation. Pharma companies are often betting on drugs that ultimately do not work, with a huge attrition rate. There are hundreds of clinical trials ongoing for new cancer treatments. Determining the best course of therapy for each cancer patient is a challenge for oncologists. Under the current paradigm, they are selecting compounds early on based on obsolete 2-D cell based technology, that is a poor predic­tor of drug efficacy in humans. With our patented 3D cell culture technology, we perform functional testing on patient’s own tumor cells in 3D, that recreate the natural architecture of the tumor in a test tube. Our technology is already commercialized as Cell2SphereTM for preclinical drug development, with initial revenues obtained. Our vision is to move this technology to the management of the oncological patient, by testing upfront the right available treatment for every patient on their own 3D cellular models, in just 2 weeks. Immune Biosolutions, a JLabs@Toronto resident, is a Canadian biotech company focusing on the discovery and engineering of humanized chicken antibodies targeting intractable membrane proteins with a recognized, yet unexploited, therapeutic potential. Membrane proteins are notoriously difficult targets for antibody discovery; they occur in low density on the cell surface and, once purified from the membrane, they are very unstable, thus presenting a challenge in obtaining sufficient amounts of antigen in which native epitopes are maintained. 1) Spatial Peptides: rationally designed synthetic peptides that replicate the native 3D structure of targets, 2) Chicken antibodies as a novel source of therapeutics, a great way to circumvent the tolerance effect of highly conserved mammalian proteins, 3) Phage display technologies combined with next-generation sequencing to explore the full diversity of our antibody libraries and to select the best binders, and 4) Evolutive humanization technologies to engineer perfect immunotherapy agents. Leveraging its Nebula Platform, IBio is advancing two of its functional anti-GPCR antibody candidates in oncology, as well as the co-development of new therapeutics with industry leaders. Immunovaccine Inc. is a clinical stage biopharmaceutical company dedicated to making immunotherapy more effective, more broadly applicable, and more widely available to people facing cancer and other serious diseases. Immunovaccine is pioneering a new class of immunotherapies based on the Company’s proprietary drug delivery platform. This patented technology leverages a novel mechanism of action that enables the reprogramming of immune cellsin vivo, which are aimed at generating powerful new synthetic therapeutic capabilities. Immunovaccine’s lead candidate, DPX-Survivac, is a T cell activating immunotherapy that combines the utility of the platform with a target: survivin.Immunovaccine is currently conducting three Phase 2 studies with Incyte and Merck assessing DPX-Survivac as a combination therapy in ovarian cancer and diffuse large B-cell lymphoma. Genomics has been used for the past 20 years primarily in research institutes, to understand the origin of life and diseases. The reduction of sequencing costs is currently pushing genomics to its industrial era, which consists in having OMIC data widely used in research institutes and also by BioPharma and Agritech industries to maximize their R&D and production activities. To jump into this new era, scientists need to analyze and interpret, in real time, an increasing flow of OMIC data and to transform them into actionable knowledge. Presently, handling this flow of information constitutes a multidisciplinary challenge, involving life scientists, bioinformaticians and data scientists. Together, they have to manage these data, to process them and to put them in context with a huge amount of knowledge. The present system is manually intensive and complicated and needs to be repeated whenever new data are introduced. The industrial era of genomics requires a TECHNOLOGY that will support an easy, efficient, cost-effective and robust integration of OMIC data into the R&D and production pipelines of companies and research institutes. We created this technology and called it MIMsOmic. To allow Life-scientists to transform data into actionable knowledge on their own. MIMsOmic platform is built around an information technology system that is an Artificial Intelligence, and more particularly a goal-oriented massive multiagent system. With MIMsOmic, life scientists can work with OMIC data without relying on bioinformaticians or data scientists, for a fraction of the actual cost of existing operations and 4 to 5 times faster. Ultimovacs’ lead product UV1 is a therapeutic cancer vaccine directed against human telomerase (hTERT). The vaccine can provide a platform for other immuno-oncology drugs that require an ongoing T cell response for their mode of action. Clinical trials in prostate, NSCLC and Melanoma have been performed, the latter combining UV1 with ipilimumab. A clinical trial combining UV1 and pembrolizumab has just been initiated in the US. Alligator Bioscience discovers and develops mono- and bispecific antibody-based pharmaceuticals for immunotherapy of cancer. The company is specialized in the development of tumor-directed immunotherapies, i.e. drugs designed for localization of the pharmacological effect to the tumor environment, resulting in an advantageous efficacy and safety profile. Alligator has a broad project portfolio comprising mono- and bispecific antibodies for immunotherapy of cancer, all with first-in-class or best-in-class potential. These projects are in various stages of research, pre-clinical and clinical development. Examples of Alligator´s pipeline programs are ADC-1013; a CD40 agonistic antibody in phase I development, out-licensed to Janssen Biotech, ATOR-1015; a first-in-class CTLA-4xOX40 bispecific antibody planned to start phase I development 2018 and ATOR-1017; a 4-1BB agonist antibody designed to have best-in-class properties in terms of safety/efficacy profile. Alligator was founded in 2001 and is located at Medicon Village in Lund, Sweden. The company is listed on Nasdaq Stockholm. Title : Dir. Buss. Dev. OncoImmunity is a bioinformatics company offering proprietary machine-learning based software to address the key knowledge gaps in the prediction of bone fide immunogenic neoantigens for personalized cancer immunotherapy. One of the company’s product offerings, the Immune-Profiler, is a machine-learning engine that predicts antigens that are processed and presented to the tumor cell surface and therefore potentially be immunogenic. OncoImmunity is dedicated to develop software solutions that facilitate effective patient selection for cancer immunotherapy, and identify optimal targets for truly personalised cancer vaccines & cell therapies in a clinically actionable time-frame. F-star is a clinical-stage BioTech developing immuno-oncology bispecific antibody therapeutics with high potential to transform the treatment of cancer. Through the application of its highly efficient Modular Antibody Technology™ platform, F-star can rapidly create bispecific antibodies with properties virtually identical to normal antibody. This offers unprecedented ease in the discovery, development, and manufacturing of bispecific antibody products. F-star’s management team has a well-established track record in building successful biotech companies and developing biologics. Partnerships have been created with leading biopharmaceutical companies including AbbVie, Merck and Denali Therapeutics. 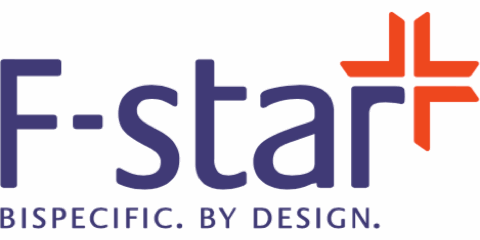 F-star has raised close to $200M in non-dilutive capital and revenues. The company currently employs over 90 people at its research site in Cambridge, UK. ​TYG oncology is developing First-In-Class therapies using a technology platform to upgrade approved monoclonal antibody therapies to a natural polyclonal antibody produced by our bodies’ own immune system, safely under Active Checkpoint Control. Our first product, TYG100, targets pancreatic cancer, and is designed to neutralise gastrin hormones G17 and G17-Gly, known growth and risk factors for gastrointestinal cancers. Our second product TYG200 is designed to trigger ADCC, CDC and cytotoxic T cell killing simultaneously. Designed to be well tolerated with no hospital administration required and designed to have no side effects, TYG200 is ready for GMP manufacture. Avvinity Therapeutics (“Avvinity”) is an immuno-oncology joint venture which is developing novel immune-oncology therapeutics called Alphamers for both solid tumours and leukaemia’s to specifically target the cancer cell by binding to over-expressed or differentially-expressed surface proteins. Avvinity’s Alphamers have demonstrated strong natural antibody polyclonal responses induced to both solid tumour and haematological tumours and have the potential to be excellent combination partner for checkpoint inhibitors with significant advantages over standard antibody or antibody drug conjugate approaches. Our technology targets patients with tumours overexpressing EGFR and resistant to current targeted therapies. Avvinity is looking for investors and/or partners to facilitate taking their promising lead drug candidates into clinical development. MBFT is a clinical-stage animal health company developing and commercializing proprietary check-point inhibitor immuno-therapy technology based on vaccines and vaccine adjuvants exclusively licensed from the Wistar Institute in Philadelphia PA. This is a platform technology from which multiple innovative products can be developed for markets worth more than $5BM. Our lead product is MBFT-201, a canine melanoma vaccine for dogs with Stage II/III resectable disease. We have completed a Phase I study that demonstrated the safety of our adenoviral-vectored product and elicited a strong immune response to the key antigens in 100% of the dogs treated. Check-point inhibitors are the ‘hottest’ field in immunotherapy today because they have demonstrated in humans the unprecedented ability to achieve durable, complete responses against melanomas and a variety of other solid tumors. They have shown particular success when used in combination with other immunotherapies, which is exactly the approach we will be taking. Based upon Dr. Hildegund Ertl’s work (Caspar Wistar Professor in Vaccine Research), we foresee additional opportunities to develop products for the emerging infectious disease vaccine market that is responding to increased government restrictions and growing consumer objections to the use of antibiotics in animals. Context Therapeutics is a clinical-stage biopharmaceutical company dedicated to creating new medicines to treat hormone-responsive cancers. 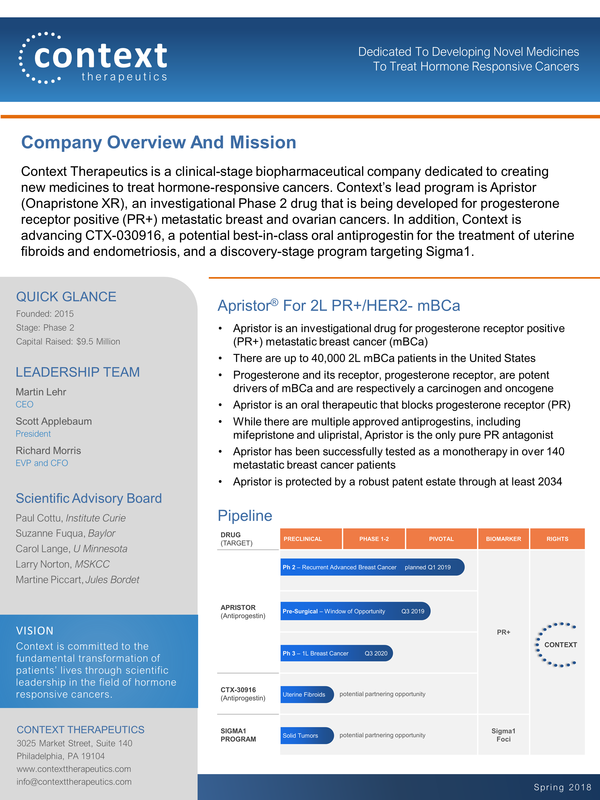 Context’s lead program is Apristor (Onapristone XR), an investigational Phase 2 drug that is being developed for progesterone receptor positive (PR+) metastatic breast and ovarian cancers. Apristor is an NCE with patent protection through at least 2034. In addition, Context is advancing CTX-030916, a potential best-in-class oral antiprogestin for the treatment of uterine fibroids and endometriosis, and a discovery-stage program targeting Sigma1. The FDA’s decision in 2017 to allow digital imagery from whole slide scanners to become a primary diagnostic tool has created a large-scale data mining problem for insurance companies, hospitals, and big pharma. Right now, millions of digital images across the country are not being analyzed because of a lack of appropriate tools and expertise. CytoSavvy’s unique patented Shape Based Modeling Segmentation (SBMS) platform combines the production of hard data associated with clinical pathology images with the significantly improved accuracy of deep learning systems to provide a powerful new solution and set of tools to address overfitting and the bias-variance tradeoff (which frequently result in accuracy rates of less than 60% vs. over 95% for CytoSavvy). We are targeting high volume drug discovery and cancer grading applications currently performed 100% manually. Our competitive differentiator is reliability. ​SimplicityBio serves life sciences companies in their translational efforts. Its machine learning platform BOSS - Biomarker Optimisation Software System turns data streams (omics, clinical, RWE, etc) into robust tailored models revealing new pathways, drug targets and biomarkers. Drug-disease interactions are complex and single markers have low clinical relevance. BOSS uses multiple biomarkers and human-readable rules to discover robust models and quantify uncertainty beyond confidence intervals. The software platform provides value to our clients from discovery to clinical validation by creating clinically relevant models for patient stratification and diagnosis, predicting activity, efficacy, treatment resistance, etc. ​AMAL Therapeutics SA is a spin-off from the University of Geneva active in cancer immunotherapy. AMAL has developed a unique protein-based immunization platform called KISIMAÒ providing activation signal to dendritic cells simultaneously to priming both helper and killer cells for various antigens and HLA restrictions. This first-in-class platform is offering the opportunity to develop standardized and indication-tailored active immunotherapies. The company’s lead product ATP128 is currently being developed for metastatic and advanced colorectal cancer. The manufacturability of the compound has been established, and currently process development and scale-up is ongoing. The GLP toxicology study will start in Q4 2018, and the initiation of the clinical trial in combination with an immune-checkpoint inhibitor is planned for Q3 2019. Ascil BioPharm Somatostatin analogues (SSAs) are the gold standards of care for first line systemic therapy of advanced neuroendocrine tumors (NETs) and long-acting SSAs are widely used in long-term therapies of NETs. However, there is an increasing evidence that clinical benefits could be obtained with higher SSAs circulating levels but it remains unreachable with current products. 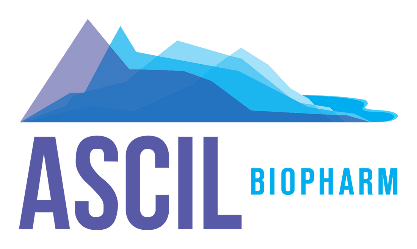 APOC is a new injectable controlled release treatment containing Octreotide developed by Ascil Biopharm and designed to cover specifically these clinical unmet needs with improved product presentation and performances. APOC allows personalized adapted treatment at selected doses and durations. APOC is currently under clinical evaluation and seeking for partner for next stage of development. IDP Discovery Pharma is a drug discovery company that develops first-in-class medicines (new chemical entities) directed to a novel class of therapeutic targets, intrinsically disordered transcription factors. We are currently focused on exploiting new mechanisms of action to treat both solid and liquid tumors. Our technology has demonstrated its capability to target two holy grails in cancer, cMYC and MASH-1 transcription factors. IDP Pharma exploits peptidomimetic technology to target up to now untapped therapeutic targets by the pharmaceutical industry. Our lead compounds are under preclinical development. ​Fimmic is a software company specialized in developing intelligent, cloud-based image analysis solutions for digital pathology. Fimmic’s unique Aiforia™ Cloud brings together Deep Learning -based Image Analysis and high-performance Cloud Computing. Our SaaS solutions enables fast, accurate, and affordable analysis support for pathologists and medical researchers requiring tissue-based image analytics. New algorithms are available on-demand or with a novel self-service model, where users are able to create their own deep learning algorithms using our browser-based interface.